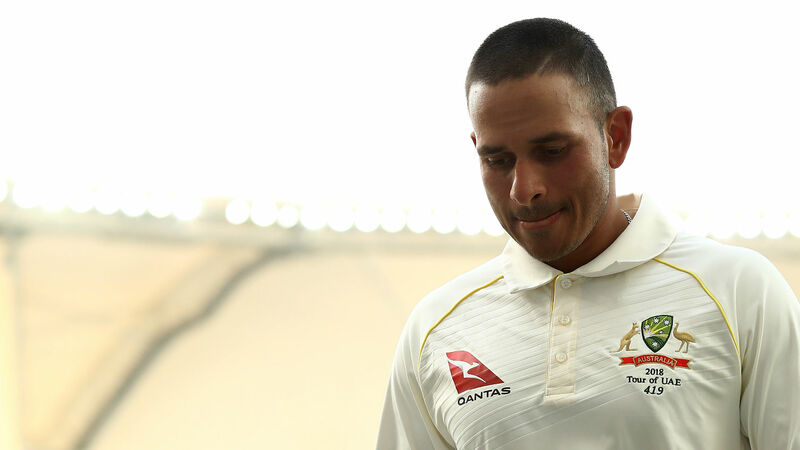 Australia face an anxious wait to discover the extent of a left knee injury which prevented Usman Khawaja from playing any part in the third day of the second Test against Pakistan. The batsman limped off the field after doing the damage in a fielding drill before the start of play on Thursday. Khawaja came to the tourists' rescue in the first Test in Dubai last week, scoring a magnificent century in the second innings to salvage a draw after making 85 in the first. The tourists may have to do without the left-hander as they face an even bigger task of trying to avoid a series defeat in Abu Dhabi, where they closed on 47-1 after being set a highly improbable 538 to win. Peter Siddle was not aware that Khawaja, who underwent surgery on the same knee in 2014, had been injured until Australia went out on the field without him. The seamer said: "We didn't see it, some of the guys might've but I didn't, he hasn't really said too much. "[It is] disappointing for him but he's getting a scan later and they'll send it to the people who need to have a look at it in the next day or so and we'll find out more. "At this stage that's all we know. Just fingers crossed for him, hopefully it comes back positive for him and he can get back out there. "It was just something in the warm-up, we were throwing the ball. So that's about all I know, I don't know what specifically happened, but something so small [and] it's kept him out. "[It is] disappointing for him but fingers crossed he gets some good news." Shaun Marsh was bowled by Mir Hamza for just four after being pushed up the order in the absence of Khawaja.